In a letter sent to British foreign secretary William Hague, a prominent human rights lawyer is alleging that Guantanamo Bay's hunger striking detainees are being threatened with humiliating body searches before they are allowed to contact legal counsel. 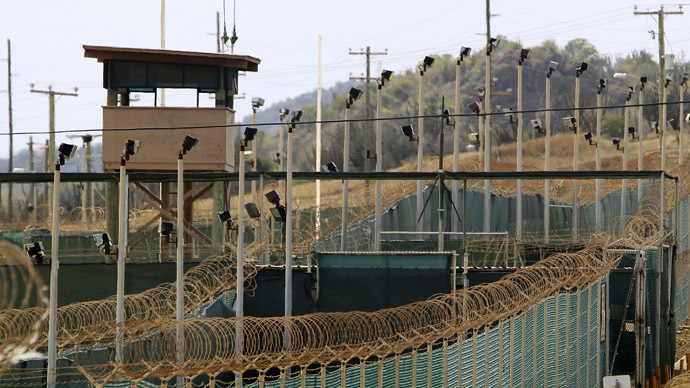 See our timeline of the Guantanamo Bay hunger strike. There are currently 100 inmates confirmed by US authorities as participating in the hunger strike at Guantanamo Bay since it began in earnest back in February, 30 of whom are being force-fed via tubes. Five of those prisoners are being observed in the detainee hospital, according to a statement by US Army spokesperson Lt. Col. Samuel House on Monday. The official numbers differ from those of human rights activists, who have put the number of strikers at up to 130. The claims by Smith coincide with failure by one of his clients, Samir Naji al Hasan Moqbel, to speak with him via telephone last Friday, allegedly due to the new policy. Moqbel, who is participating in the hunger strike, was the recent author of a New York Times op-ed which detailed the pain and emotional impact of being force-fed by nasal tubes. Agence France-Presse (AFP) has independently reported that another lawyer, David Remes, had two detainees he currently represents decline calls due to the new search procedures. "Under the new search policy, a detainee who leaves his camp is subject to a search including his private parts and holding his private parts," Remes said. He added that the "shocking" searches were "designed to deter many detainees from meeting with their [lawyers] … to make their life more miserable and put the detainees in front of an impossible choice." "Full frisk searches are conducted in a professional manner to quickly locate and identify contraband hidden on the body. The searches are conducted with clothes on, similar to a pat-down search conducted by an airport security screener," says House. According to House, the new procedures were enacted "in light of contraband discovered during recent cell searches." For his part, Smith believes the allegedly invasive searches cannot be justified. "Any pretext given for these new rules is just that: a pretext. The prisoners do not need to be sexually assaulted in order to be taken to a telephone to talk to their lawyer," he said.